A simple explanation for why China’s economic growth is slowing is that China is due for a slowdown. Even if you don’t subscribe to strong versions of the middle-income trap theory, which I don’t, there is still a very obvious tendency for developing countries’ growth rates to decline as they get richer. China is now an upper-middle-income country, with per-capita GDP of around $12,000 at purchasing power parity, which means it has less of the rapid “catch-up” type of economic growth to do. It is also an economy with $10 trillion in annual output, which means that high percentage growth rates are now pretty difficult to achieve. Our statistical exercise forecasts a slowdown in both regions, but the pace is quite different. 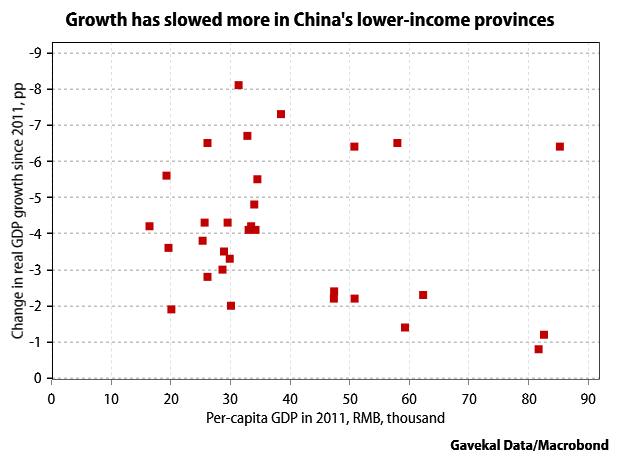 In the developed provinces, the slowdown is relatively rapid, though not abrupt. Expected growth in these provinces falls to 7% in the five-year interval beginning in 2016. However, the expected pace of slowdown in the emerging provinces is even less. Expected growth in these provinces doesn’t fall to 7% until sometime during the five-year interval beginning in 2024. The reason for this discrepancy is that the emerging provinces have a long way to go before they reach income levels associated with the middle-income trap. This implies that, in the near future, rapid growth in China will be concentrated primarily in the Chinese interior rather than in the more advanced areas near the coast. For example, by 2020, growth in the developed provinces is expected to slow to a still-healthy, but unexceptional 5.5%. But growth in the emerging provinces is expected to remain a robust 7.5%. Thus, China’s overall growth slowdown may not be severe. The advanced provinces may indeed reach income levels associated with the middle-income trap. 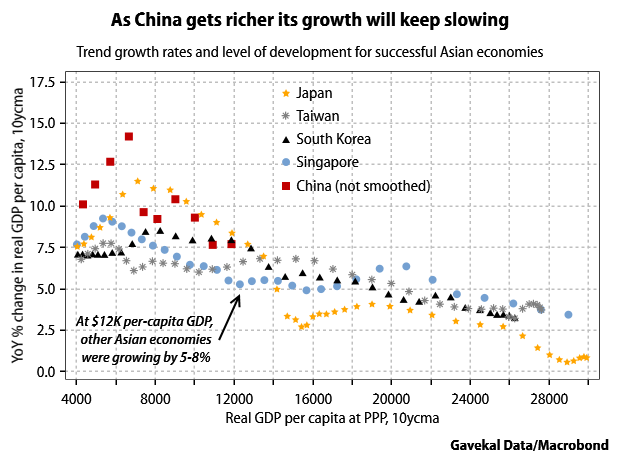 But rapid expansion in the emerging provinces will at least partly offset the overall effect on China’s growth. Intuitively this makes a lot of sense. And the high growth potential of the developing inland provinces is one reason that optimists have cited for expecting continued decent growth from China; see this August paper, and also Timothy Taylor. But I’m less sure these days that this is the right way of looking at what’s going on in China. The reason is that the current slowdown does not look much like what the San Francisco Fed researchers predicted just a couple years ago. Rather than a slowdown led by richer provinces, we have a slowdown that generally much deeper in the poorer inland provinces. As the chart below shows, more of the severe growth slowdowns have occurred in what are still fairly low-income provinces. Beijing and Shanghai (in the bottom right corner) have hardly slowed at all by comparison. What does this tell us? I don’t claim to have figured out all the implications yet, but this evidence does not seem to favor accounts of China that emphasize a loss of competitiveness due to high wages, and a slowdown in productivity growth due to the maturing of the economy. To put it more simply, it does not look like the middle-income trap has sprung on China. The middle-to-high-income parts of the country are doing okay, while the lower-income parts are challenged. I’ve posted a few times on this blog about the woes of China’s rust belt (aka The Manchurian Recession), and it’s pretty clear that these places have fairly serious issues and are not enjoying an unproblematic convergence toward the higher-income coast. As some of the more skeptical commentary about the inland provinces is now starting to emphasize, rather than benefiting from their relatively low wages, in fact these places are having a lot of trouble competing with the accumulated and institutionalized advantages of the richer provinces. The current troubles don’t necessarily mean the inland provinces are permanently stuck, but we probably need to look more closely at the specific mechanisms by which the inland provinces can achieve high growth and convergence. My own preferred account of China’s current slowdown would emphasize the central role of the past decade’s housing boom, and the way this boom reinforced an existing bias toward heavy industry in many of the inland provinces (a bias with roots going back to 1950s). Capitalizing on the housing boom allowed these provinces to achieve rapid growth and convergence for a while. But this convergence was built on poor foundations as the industrial structure of the inland provinces could not survive the end of the housing boom, which meant that demand for construction materials has stopped growing. Meanwhile the richer coastal provinces, with their more diversified industrial sectors and much higher levels of human capital have been able to adapt better to the rapid changes in the economy. The conventional wisdom on the coastal provinces, which has emphasized the challenges from their dependence on exports and relatively high wages, also looks in need of an update. ← Previous Post Are African economies doing better or worse than we thought?